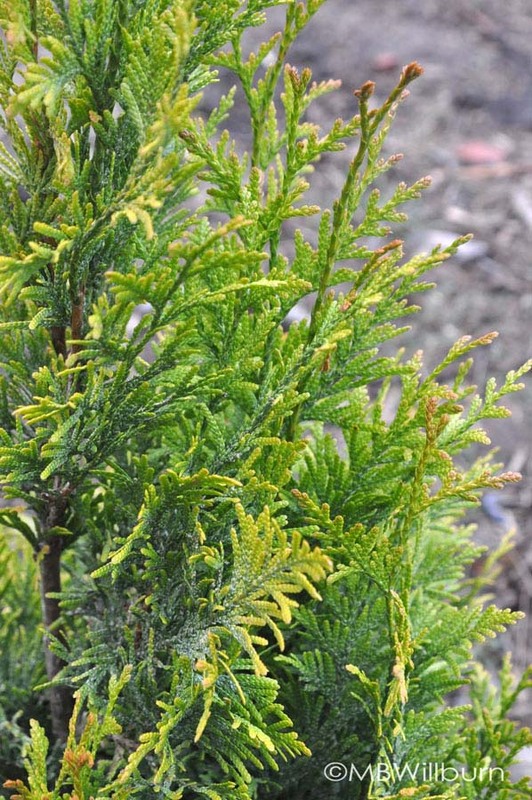 The golden orange tipped foliage of Thuja plicata ‘Daniellow’ lights up the winter garden. You then made a note to pick whatever x was during the clearance sales; or to look around in cheap junk shops for x; or galvanize yourself to finally buy x when you next saw it. In other words, you observed something during the season, made a note of how beautiful/useful/stunning it was, and waited for the next acquisition opportunity to arise. This is exactly how I’d like you to think about your garden. In a few short weeks, spring will assault us, and bright, hypnotic colors and textures will come from every angle. 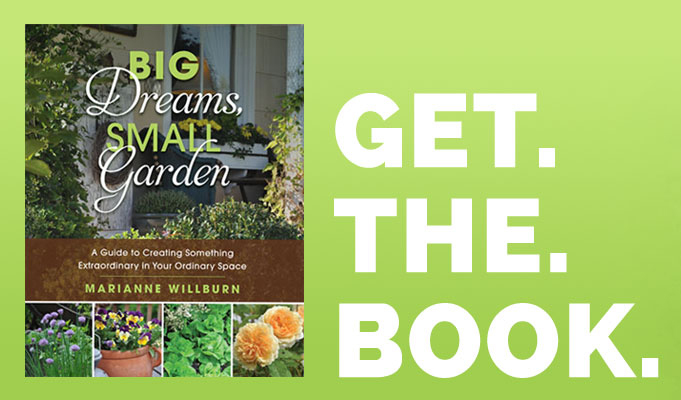 It will be almost impossible to remember the times of the year that are dull and grey and threaten to have your gardener’s license revoked for non-participation. 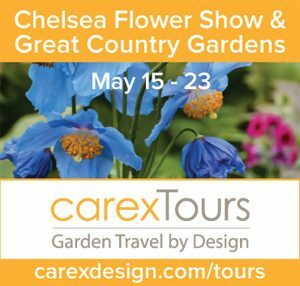 So it’s time to look around, see what’s blooming in the gardens of other gardeners, public gardens, and friends, and write them down for spring planting and a better future garden. But what about when that hellebore is nestled under the feet of a blooming paperbush (Edgeworthia spp. ), and nearby the soft, dissected foliage of ‘Soft Caress’ Oregon grape (Mahonia eurybracteata) holds spikes of silver blue berries from yellow flowers borne in earliest winter? Add a few crocus and a couple snowdrops, and your winter garden has just taken on star power. Put the whole shebang near the front walkway, and so has your winter attitude. Lenten rose – (Helleborus spp.) 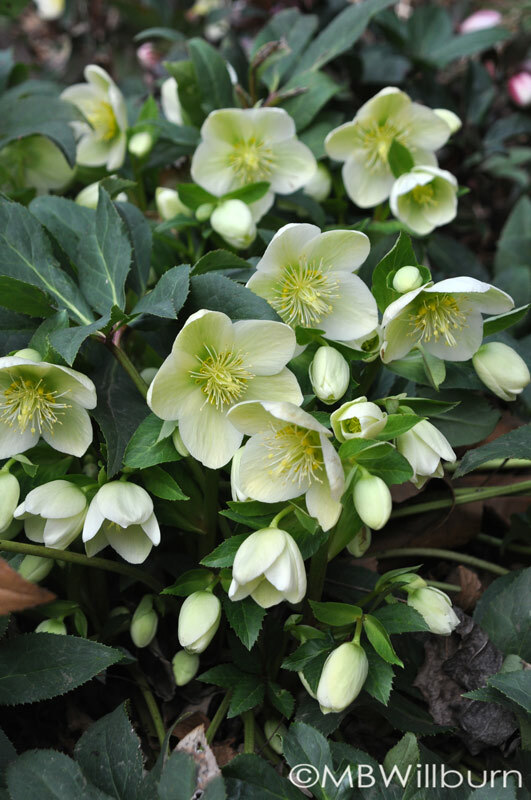 Hellebores are a terrific place to start both because hybrids are becoming more and more popular (read: available), and they are an incredible garden survivor for shade or sun. 12” high with an 18” spread, their cup like flowers have been blooming for a few weeks now and will continue to bloom as winter comes to an end. Z4-9. 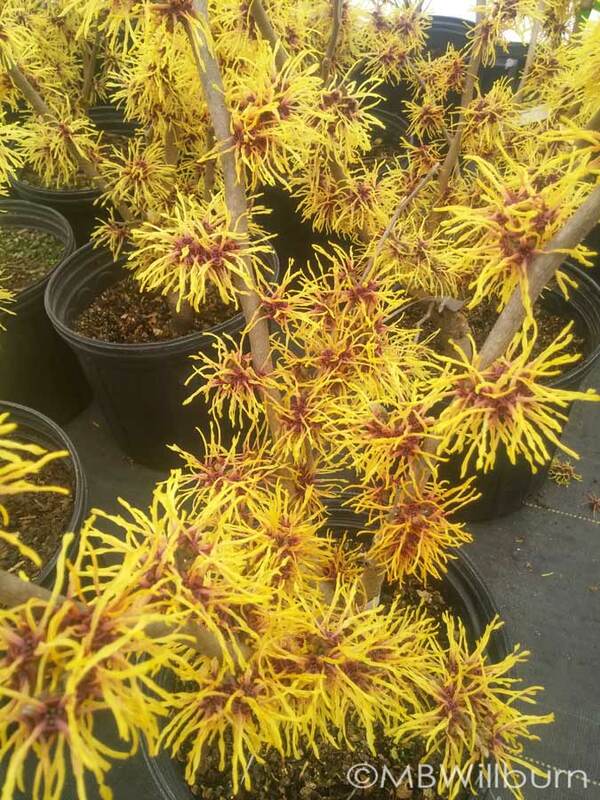 Witch Hazel – (Hammemelis spp.) 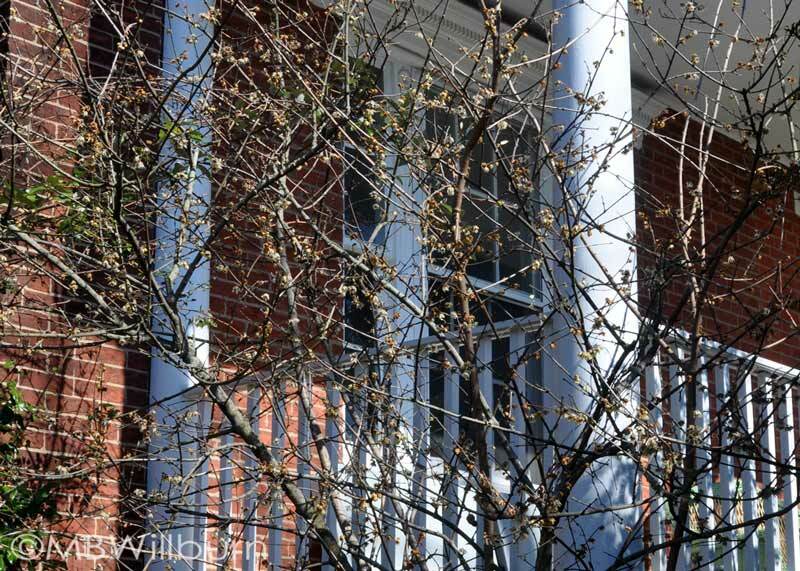 – Forget about that forsythia bush taking over the back garden – a witchhazel is a well behaved small tree (10-20’ on avg.) that bursts into flaming colors of red, yellow or orange, and does so with a sweet scent that perfumes the mid-winter air. Z3-9. 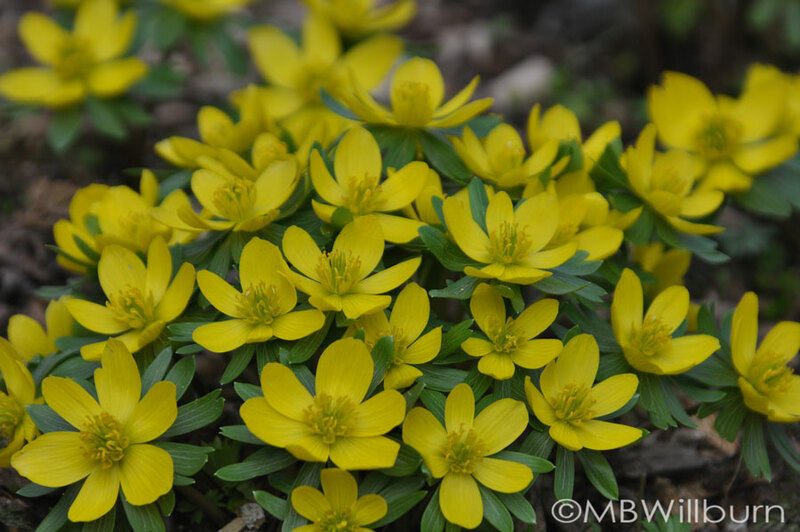 Winter aconite – (Eranthis hyemalis) – When you spy these bright, low growing yellow flowers with Elizabethan ruffs ‘round their necks in someone else’s garden, your first instinct will be to grab the trowel and wait for your host to turn his back. 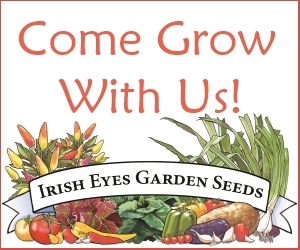 They seed prolifically and once you’ve got them in your garden, you’ll have them for years to come. Z4-9. Early daffodils – (Narcissus ‘February Gold,’ ‘Tête-à-Tête) It doesn’t have to just be about April when it comes to daffodils, nor about crocus when it comes to early bulbs. 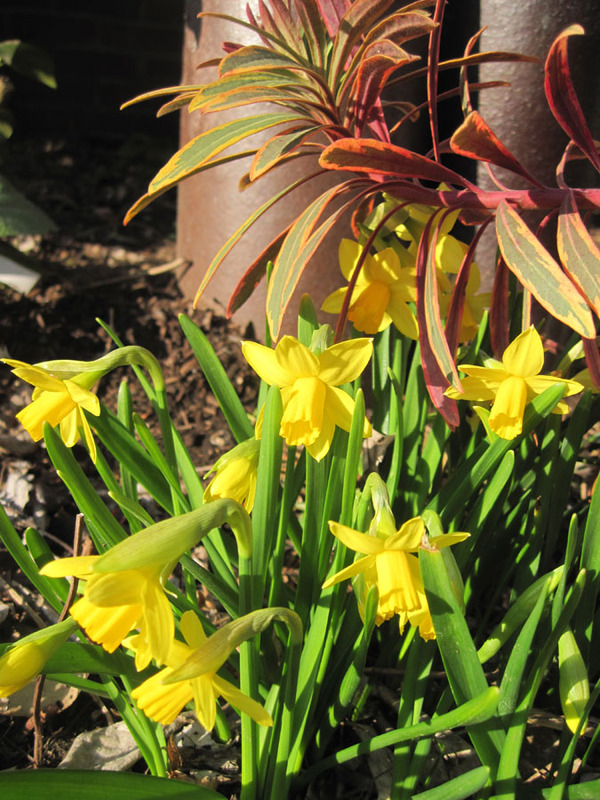 Planting a few clumps of the earliest daffodils can have you whistling spring tunes when winter winds are blowing. Z3-9. 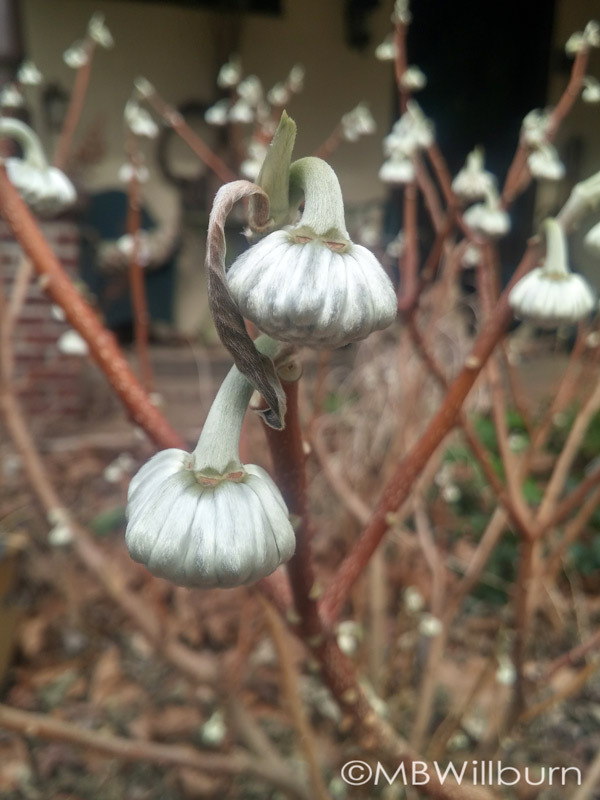 Paper bush – (Edgeworthia chrysantha) We are always told that edgeworthia sits right on that edge in our Mid-Atlantic gardens, yet I and others grew this fabulous shrub right through the bitter winters of ’13/’14 and ’14/’15. Fuzzy white umbellate buds are held from late fall, and in the early winter, open into bright balls of yellow. Spring and summer foliage is velvety and sumptuous. One of my very favorites. Z7-9. Wintersweet – (Chimonanthus praecox) The name says it all. A waft of wintersweet blossoms in January and February makes it possible to face the ice coating your driveway. 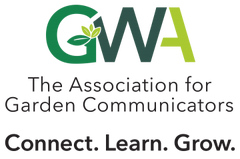 A 10’ x 15’ shrub that works best in the background or against a warm wall. Z7-9. Chimonanthus praecox – it’s all about the scent. 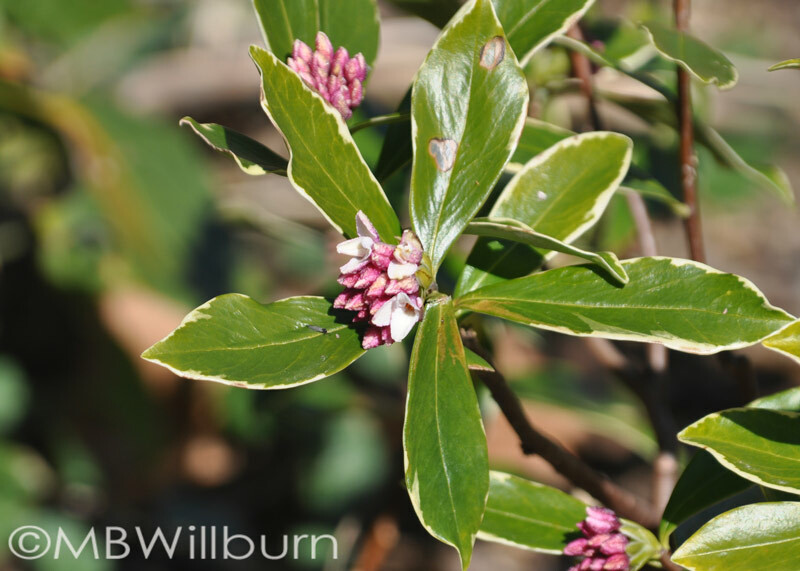 Winter daphne – (Daphne odora) – It’s common in warmer climates, but we Mid-Atlantic folks can grow this insanely fragrant small shrub with a little bit of protection and an understanding that it could all end in tears. Drainage, drainage, drainage, morning sun, afternoon shade. That is most of the story. Let me know how it goes – I’m on year two with mine. Z7-9. There are so many more, but as usual, I must stop short lest the eyes glaze over. Taking some time right now to observe what you love and planting some of that this spring means that next winter you won’t be wistfully wishing you had.